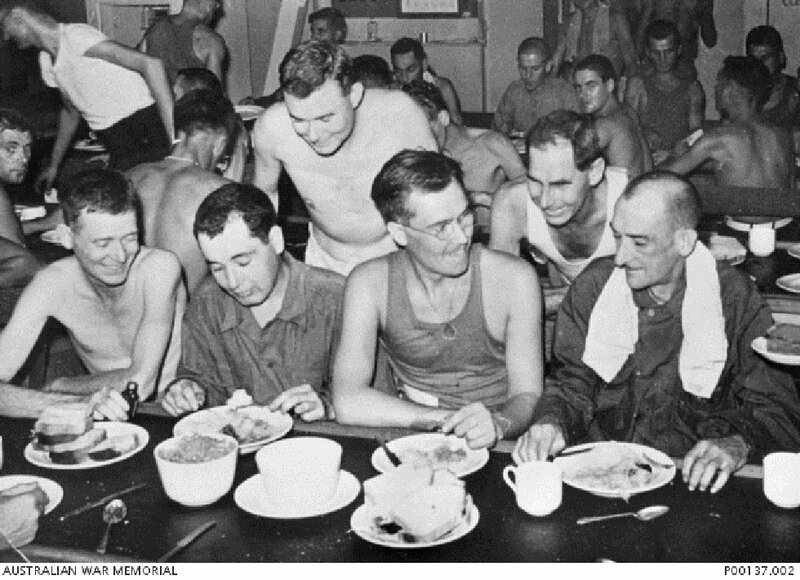 Enroute from Japan to Australia, liberated Australian POWs on board the hospital ship 'Tjitalengka' enjoy a meal. Image taken August 1945, provided courtesy of Australian War Memorial. 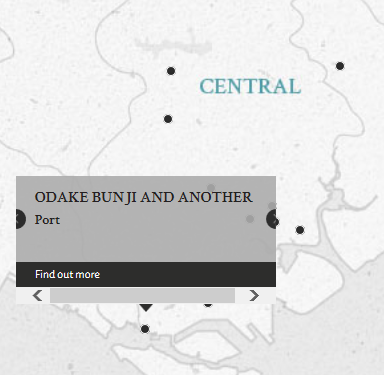 The 1st defendant Odake Bunji was the ships master of the Asaka Maru, a converted Japanese merchant ship used to transport POWs from Singapore to Japan. The 2nd defendant Lieutenant Ino Takeo was the draft officer of the journey where 750 POWs were transported. The conditions on board were terrible with inadequate room to house the POWs and insufficent lifeboats. After encountering a typhoon, the ship ran aground and the POWs had to be transferred to another ship, the Hakusan Maru, to complete their journey. The conditions were not much better. Both defendants were charged with illtreatment of the POWs during the voyage due to the gross overcrowding, inproper sanitation, lack of food, drinking water, and medical supplies onboard both ships as well as the lack of any safety precautions for attacks given that there was no indication that the ship was carrying POWs. The court found both defendants guilty however their sentences where not confirmed by the convening authority which found that there was insufficient evidence to find that both men were directly responsible for the ill-treatment as the shore authorities and the exigencies of war were also responsible for the poor condition of the POWs onboard the ships. The Asaka Maru is an example of the "Hellships" which were used to transport Allied POWs across the Japanese Empire during WWII. The conditions faced by the POWs in this case were similar to many others however unlike many others, the voyage of the Asaka Maru and Hakusan Maru did not end in a tragic sinking by Allied attacks, with most of the POWs surviving the voyage. The Hakusan Maru began life as the USS Federal, a freighter acquired by the U.S. Navy during WWI as a military transport ship and was sold to the British before being captured in 1940 by the Japanese, who renamed the ship the Hakusan Maru. Odake, Bunji. Ships' Master. From Japan. Guilty. 6 months' imprisonment. Sentence not confirmed. Ino, Takeo. Lieutenant. From Japan. Guilty. 3 months' imprisonment. Sentence not confirmed. Urquhart, R.M. Captain. From British military. Seaforth Law Student. Taro, Abe. LLB, Supreme Court Tokyo.